Tune in Saturday night at 10 for Swing with Bill Cartwright and check out the great tunes from the Blue Wisp Big Band, Linda Ronstadt, Louis Armstrong, and Harry James. Tune in Saturday night at 10 for Swing with Bill Cartwright, and you’ll enjoy hearing some of the essentials including Rosemary Clooney, Dean Martin, Count Basie and Glenn Miller. Tune in Saturday night at 10 for Swing with Bill Cartwright. You’ll hear vocalists like Bobby Darin, Doris Day, Ella Fitzgerald, and Frank Sinatra. Plus the bands of Count Basie, Glenn Miller and more. Tune in Saturday night at 10 for Swing with Bill Cartwright. On this week's program you'll hear from the Rat Pack founders Frank Sinatra and Dean Martin, plus the sensational bands of Benny Goodman, Glenn Miller and Woody Herman. Also along for the ride are The Andrews Sisters, Louie Armstrong, and much more! Tune in Saturday night, November 2nd at 10 for Swing with Bill Cartwright. On this week's program you'll hear from some of the great vocalists in music, including Nat Cole, Peggy Lee, Bobby Darin, Doris Day and Diana Krall, plus plenty of big bands. Tune in Saturday night at 10 for Swing with Bill Cartwright. On this week's program you'll hear from a sensational lineup of vocalists including Nat Cole, Ella Fitzgerald, Frank Sinatra, Tony Bennett, and the incomparable Keeley Smith! Our condolences to the family and friends of former WVXU program host Annie Wagner on her passing this past Sunday. 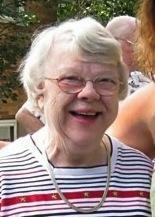 Details of her career and funeral arrangements can be found here.